Bramwell Tovey conducted the world premiere of John Estacio's opera Filumena in 2003. He also led performances at the Banff Centre in 2003 and the National Arts Centre in Ottawa in 2005. Visit the opera's website for more information about this great contemporary work. 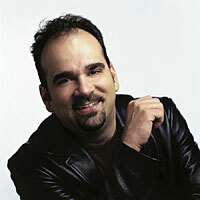 Bramwell won the 2003 Betty Mitchell award for Outstanding Musical Direction of Estacio's brilliant score.